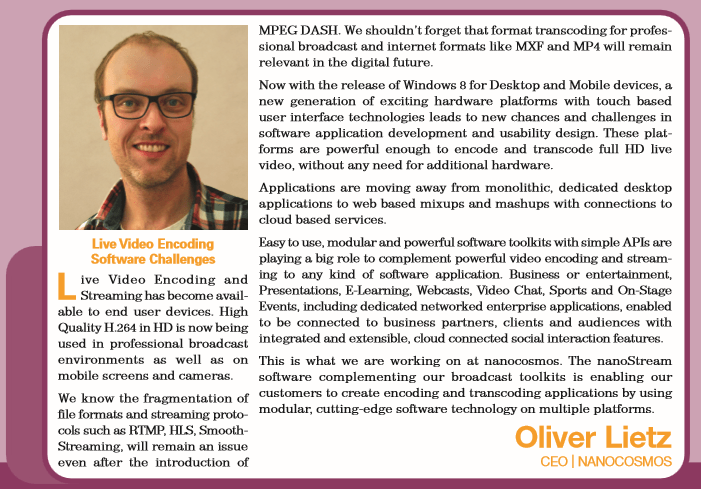 Read nanocosmos CEO Oliver Lietz Executive Vision as being published in the StreamingMedia Magazine 2012 ! See the Streaming Media SourceBook for further info! Now that Live Video Encoding and Streaming has become available to end user devices. High Quality H.264 in HD is now being used in professional broadcast environments as well as on mobile screens and cameras. We know the fragmentation of file formats and streaming protocols such as RTMP, HLS, SmoothStreaming, will remain an issue even after the introduction of MPEG DASH. We shouldn’t forget that format transcoding for professional broadcast and internet formats like MXF and MP4 will remain relevant in the digital future. Now with the release of Windows 8 for Desktop and Mobile devices, a new generation of exciting hardware platforms with touch based user interface technologies leads to new chances and challenges in software application development and usability design. These platforms are powerful enough to encode and transcode full HD live video, without any need for additional hardware. Applications are moving away from monolithic, dedicated desktop applications to web based mixups and mashups with connections to cloud based services. Easy to use, modular and powerful software toolkits with simple APIs are playing a big role to complement powerful video encoding and streaming to any kind of software application. Business or entertainment, Presentations, E-Learning, Webcasts, Video Chat, Sports and On-Stage Events, including dedicated networked enterprise applications, enabled to be connected to business partners, clients and audiences with integrated and extensible, cloud connected social interaction features. This is what we are working on at nanocosmos. The nanoStream software complementing our broadcast toolkits is enabling our customers to create encoding and transcoding applications by using modular, cutting-edge software technology on multiple platforms.